It's been a long time since I made the cables I'm presenting here, yet I have never seriously thought of them as a project for TNT Audio. I thought the topic was a tad redundant, due to the presence on the same TNT pages of the famous FFRC, and due to several other designs, all made up from the same CAT 5 UTP network cable, spread around the Net and much discussed on our discussion group. So, I'd rather avoid adding my opinion on it. At least until when, during a period in which I was particularly interested in experimenting with different kinds of cables, I actually ended up making almost all of those projects plus other that I knew, all based upon CAT 5 cable. I systematically found their characteristics much weaker than my own cables' (and this with almost every system I happened to test them). Moreover, considering the positive feedback received from various audiophiles - whom I "confidentially" told about my design - after they made them, I made up my mind to publish my project to all of you TNT Audio readers. Let's state it clearly: I am not saying this is the best speaker cable design sporting UTP CAT 5 wire, but only that, based on my listening experiences, and using my evaluation criteria, I just didn't find anything better. That's all. Now, let's take a good look at those "TNT tripleT"! Making the cables - Let's Twist Again! The basic material is, as already stated, network cable UTP CAT 5, sporting 24 AWG solid copper conductor - just make sure it's the best quality you can get. The total length is the sum of the desired length, plus about half a meter needed to compensate for what you are going to lose due to the "twist" and the terminations. In other words, should you want to make a pair of 3 + 3 meter-long cables, you must take into account 3.5 meters and multiply the total times 12 (ex: 3.5 x 12 = 42 m). That kind of network cable is pretty easy to find at a very cheap price (about a 0.25 Euro/meter, at least in major cities, so you need only a little over 10 Euros for all the stuff). From the above calculations, you clearly guess that for each channel you need six length, making a "seriously" dimensioned cable. Those six segments of cable will form three "twin" pairs that will be twisted together, like our TNT-TTS power cable (I'd say that the pictures are very explanatory). It's recommended to keep the twin pairs always coupled, and not to overleap them while twisting them, in order to realize a rather "flat"-looking cable. Some advice: if you have to make a long cable, start from its center (it will be easier to periodically unroll the cables you are twisting), and keep the same direction for all the segments of cables (you just need to look at the writings on their outer sleeve). When you are finished twisting, after having fixed both the edges of the braid with some tape to avoid it loosening, start peeling the cables. Open the sleeves for a dozen centimeters, taking care not to cut the internal conductors, and (provided you don't have the right tool) use a simple lighter to heat, one by one, all the little wires (that you have already untwisted) up to a couple of centimeters from their edge (be quick, or else you'll get a big flame: you'd better practice a little bit on a spare piece of cable...:-). Once heated, the sleeve is easy to peel: simply grab it with your fingernails and pull with decision, in order to avoid any mechanical stress to the inner solid copper conductor. Twist all the white cables together, and twist all the coloured ones togehter. Finish them with your favourite terminators (rounders, spades, bananas, silver soldering, etc.). What you have just finished will be the amplifier side. watch out for the coloured signs! 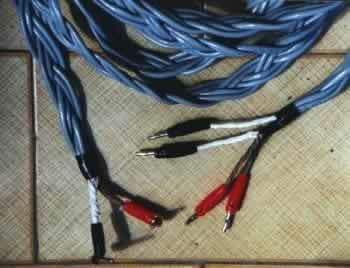 The "TNT tripleT" speaker cable is set for biwiring, so that all the terminations, speakers side, will be a tad different: for each way, you use just one wire of each "twin pair". In practice, look carefully at the cable you made up to this point. Select the right-side cables of all the pairs (as an example, take a look at the picture that particularly shows the red-coloured cables). Peel the sleeve off all three cables, free the pairs, separate the white wires from the coloured ones, and twist them together. After making the same thing with the remaining three segments (that is, the left-side cables of each twin pair - the green-coloured ones in the same picture), peel the wires with our usual lighter system and finish it with your favorite terminations. After finished the first cable, repeat all for the second one, and that's all! The TNT tripleT finally finished! Listening to these cables with an extremely revealing system, they sported a well extended and articulated bass range, a polite and never-invading midrange, cold-leaning mid frequencies, yet with rather good thickness, sharply glossy mid-highs, and very refined and accurate extreme highs. Their spatial reconstruction ability is simply very good (I'd say incredible, bearing in mind its cost), and is the real strong point of "TNT tripleT". There is a lot of air between the elements, which also sound stable and focused (here I experienced a relevant difference compared with the other cables I could test!). Their dynamic features are at very good level, too. 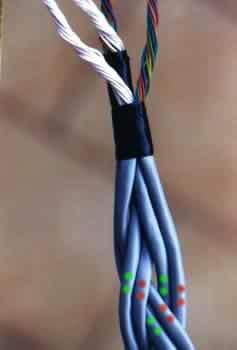 So, a pair of speaker cables that are rather strongly characterized with a dry and accurate musical attitude. Just those characteristics may even have a disturbing result if used with systems that are already characterized by a kind of coldness or an extereme mid-high range analytic ability, making music reproduction excessively aggressive. Yet, I could use them with sure satisfaction with systems of different kinds: they only have to be not too brilliant. It's worth noting that, on more than one occasion, they gave detail and air to systems sporting flat sounds, but a little opaque (due to the synergy between their components, rather than the room characteristics); and that they magnificently integrated in an all-tube system featuring a high quality sound, yet with somewhat "old style" character. 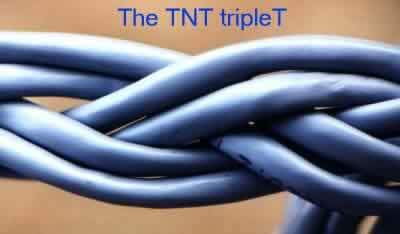 That's all: ciao to everybody and wishes of a joyful time to all of you who dare to realize our "TNT tripleT"!!! How to print this article.